Noodles seems to be the ‘go to’ food in many Nigerian families. Some kids don’t even know the name of any other food because their breakfast, lunch and dinner revolves around ‘indomie noodles’…the most popular brand (hope i’m still right). I don’t have anything against giving noodles to kids except that that style of serving it to them just ‘boiled’ plain with the sachet contents. Haba mummy!!! even the packaging of all the various brands of noodles have some sort of healthy garnishings on them. 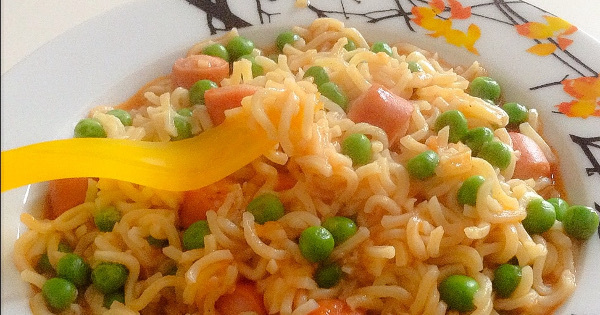 It is just like making fried rice by boiling the rice with seasonings only and then serving it as it is without the carrots, peas and orishirishi…definitely that food will be looking back at you long after it is served. Children are attracted to nice looking or colourful (not so much at a time) plate of food and ultimately need all the nutrition they can get for the healthy development of their body and brain of which vegetables play a part, even though they may not like them. We will keep trying. Green peas or your choice of vegetables. I prefer using one or two vegetables in order not to bombard the noodles with colours as some kids will use half of the mealtime picking out veggies they don’t like. Put water in pot and bring to boil. Add the stew, noodles and sausages (and carrots if using) . Stir and simmer till soft. Add a little of the seasoning pack if you wish or think it needs it. I personally don’t think it is necessary because the tomato stew is seasoned and sausages contain salt. Add the peas, stir and bring down to retain freshness. The heat from the pot will cook them well. Ensure the noodles still have considerable liquid when you remove from heat and serve. It will be soaked up by the noodles and give it a moist texture as against a dry one. Don’t be too hasty to add the seasonings because it will increase the salt content which is not particularly good for children, especially toddlers. You can combine noodles with other foods and vegetables for versatility. I will be adding other variations. Dz is a lovly concept,thx 4sharing. I’l definitely follow ur method . Thanks Winnie, glad you like it. Nice concept. Look forward to seeing more as i’d love to try them out. Thank you so much Teekay. Keep looking through for more.